Having access to your important data on all your computers and devices is becoming increasingly important to pretty much everyone. SyncMate 2.5 comes in both free and expert editions, and offers data synchronisation with a range of devices and services, including Macs, PCs, Windows Mobile or Nokia S40 phones, Google (including 'Android' phones), Sony PSPs and USB flash drives. The free edition will sync only contact and calendar information, as well as certain system preferences and SMS messages from supported phones. 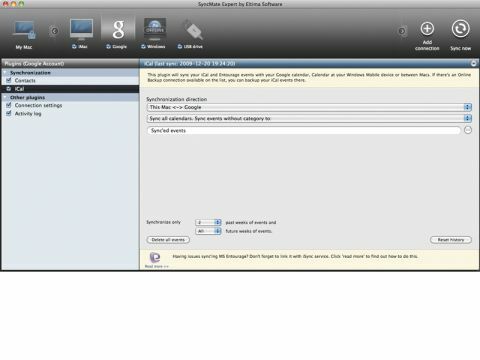 The expert edition also syncs iPhoto, iTunes, Safari, Firefox, folders and Mail messages. Both editions also offer online storage for storing data and settings. To use it, you launch the application, tell it what kind of connections you'd like to set up and then decide whether to merge or overwrite data. If you want to sync with a Mac, install SyncMate on it. With a PC, install the SyncMate Windows module. Although the interface is aesthetically challenged and typo-ridden, it's still quite usable. But while the program does a good job of synchronising most data, we found there were some glitches. Times and dates on some Google Calendar events would show up incorrectly, for example. Anything less than 100% reliable syncs makes such software potentially dangerous, so we wouldn't recommend using SyncMate without making backups and experimenting first to see if it works with your setup. If so, it has the potential to be a premier tool for synchronisation.